Cover crops are widely considered as an effective means for improving health of soil; however, there are several questions surrounding their adoption. The document answers some of those questions covering cover crop adoption, conservation policy, and crop insurance. 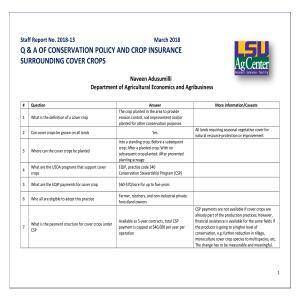 The Q&A is not a comprehensive list; however, includes several answers to those questions that the LSU AgCenter extension faculty and agents have identified as those that frequently come up in discussions with the farmers.